Loddon Plains Landcare Network member Bill Twigg had a special sighting recently, seeing a Sugar Glider on his Bears Lagoon property. A rare occurrence for the LPLN area, according to Bill there have been no sightings on his property for generations. “I heard the dogs barking and went outside to see what the racket was and saw the glider glide between two trees.” Bill said. Bill said that if his Landcare works have in any way helped to bring the Sugar Glider back to his property then it has all been worth it. 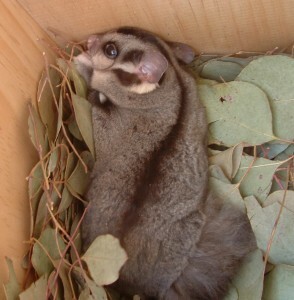 If you don’t know what the little Sugar Gliders look like, see the photo below for an idea. Photo courtesy J Blackney, Trust for Nature. If you have anymore interesting faunal sightings, feel free to let us know!